BYU research shows how families can be strengthened through experiencing adventures together. It seems intuitive that families that play together are happier than those that don’t. Research, in fact, backs up that general idea. Delve a little deeper, and it seems logical that some kinds of recreation might build happier families than others. Going to Disneyland, for example, “the happiest place on earth,” makes families happiest, doesn’t it? Well, no. At least not necessarily, say BYU researchers Brian J. Hill, ’86, and Mark A. Widmer, ’88, who have been studying family recreation. Think about it. How unifying is it, really, if Mom heads for Mr. Toad’s Wild Ride with the younger kids and Dad goes off to the Matterhorn with the older ones? They meet up in the middle of the day to wolf down hot dogs and Orange Crush before splitting up again. Contrast that scenario with a family survival trek: Instead of flying off in different directions, you stick together almost all the time (okay, not an entirely attractive notion); instead of studying the Disneyland map to find Frontierland, you study topographical maps, a guide to native plants and animals, and astronomy. The survival trek, the BYU researchers explain, is a far more family-strengthening and satisfying experience than Disneyland. The difference is the challenge, which in turn provides abundant opportunities for families to problem-solve together. The results, say Hill and Widmer, include an array of family benefits. “If you can move a family into a new environment with challenging activities where they have to work together and spend extended time together, then you see improvements in communication, increased trust and support, increased affection and kindness, and reduced conflict. These things work together to improve family cohesion,” says Hill, chair of BYU’s Recreation Management and Youth Leadership Department. He and Widmer, an associate professor in the department, have conducted studies to explore the dividends challenging activities (not necessarily as severe as a survival trek) can yield families. Joining them are associate professor Patti A. Freeman, ’88, and instructor Mary Sara Wells, ’01, both in recreation management and youth leadership, as well as J. Kelly McCoy, an assistant professor of marriage, family, and human development, graduate student Christy Huff, ’02, and dozens of undergraduates. In one study they followed several groups of families involved in outdoor recreation at various levels of difficulty and observed how such recreation affects parent-adolescent communication. They decided that, unlike other studies, they wouldn’t ask only the parents about their experiences but the teenagers too. The first group, with seven families, did a four-day survival experience: hiking with handmade backpacks through harsh desert terrain; gathering their own grubs, grasshoppers, and ants for meals; and collecting water from puddles in an otherwise dry riverbed. 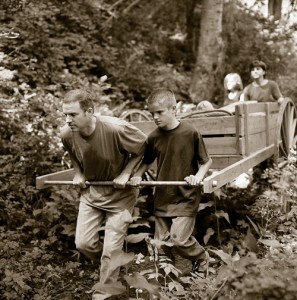 Eight families went on a handcart trek, the “intermediate” challenge. For 16 miles over four days, they pulled handcarts loaded with food and gear. Instead of grubs and grasshoppers, they enjoyed fruit, bagels, barbequed chicken, and stew. Eight families stayed at a ranch, sleeping in rustic cabanas, enjoying water relays and canoeing, and eating meals prepared by ranch staff. Through challenging recreation families can develop their “collective efficacy” – or sense that together they can overcome challenges – say BYU researchers. Photo by Bradley Slade. A recent study by Widmer,Wells, and McCoy, reported in the April 2004 issue of the peer-reviewed journal Family Relations, zeroed in on families with at-risk youth. The researchers theorized that challenging recreation provides an “overwhelming mastery experience” and increases the family’s “collective efficacy”—a concept developed by Stanford psychologist Albert Bandura that means the belief among members of a group that together they can overcome whatever challenges come their way. According to Bandura, such a belief can profoundly improve behavior over the long term. So if your family is cohesive and communicates well, can you just go to Disneyland? Well, pure fun, as opposed to challenging recreation, has its place. Variety is nice, too. But Hill and Widmer think it’s a good idea for all families to find challenging activities. “When I talk to people I use the term ‘adventure.’ Every so often a family needs to do something adventurous,” says Hill. Parents should be prepared to spend some time planning and preparing. Adventures that include challenge almost never happen spontaneously. “The research is clear that you can’t have good experiences by just sitting around. It almost always takes effort and concentration. It’s not like watching TV or going to the movies or going to Disneyland,” says Hill. Of course, it’s possible for parents to go to a lot of trouble to design the perfect adventure for their family and find that it doesn’t turn out very well. Putting your family in a situation they can’t handle, like going on a survival trek when you’ve never been camping, is a setup for disappointment. “It just raises the conflict and you just get more frustrated,” says Widmer. Hill says the basic message is that it’s good to do hard things. Sue Bergin is an adjunct faculty member in the BYU Honors Program and a writer and editor in Orem, Utah. • Do set aside enough time for choosing an activity, planning it, and preparing for it, and include all family members in this process. • Don’t make some family members (like Mom) take on more than their share of planning and preparing. • Do choose recreation that will challenge family members to learn new skills. • Don’t choose recreation that is so challenging it’s likely to create more frustration than unity. • Do expect hitches in your plans, complications once you’re on your adventure, and conflict over how to solve the problems. • Don’t overreact when inevitable complications appear. Instead, treat problems with humor and patience. • Do adapt recreation to meet your family’s specific needs.